The average price of a Super Bowl ad swelled to $4.5 million for a 30-second ad, according to a report by The Wall Street Journal. This reflects a 75 percent increase in Super Bowl ad prices over the last decade. Fortunately for small business owners, you don’t need a few million dollars to produce a quality ad. An article by Direct TV suggests you can produce and air a local commercial for under $1,000 depending on your budget, air time and goals. While there isn’t an exact science to getting started in TV advertising for small businesses, there are ways to streamline the process and stay on budget. Before calling TV stations and production studios, sit down and map out your goals. If you’re launching a business, plan an advertising campaign around announcing your services and raising brand awareness. But if you’re promoting a product, you should refine your messaging, determine your target audience for the specific campaign and develop a client avatar to help envision who will see the ad and what will appeal to those viewers. Unless you need to reach a global audience, scale down to local advertising to refine your messaging and keep your budget on track. Ask your marketing team to come up with a plan for how often the ad should run to decide if consistent or periodic exposure works best for your needs and length of your promotion. Once you’ve set your primary goals, call a few TV stations to help get clarity on your budget. Media buys can be complex and include inexpensive middle of the night runs all the way to costly prime time air time. But unless there’s a specific reason why you need to advertise on national television, choose cable TV advertising and get a bargain. You can target a popular cable show and still run your ad locally for a fraction of the cost. Ad production costs can be as expensive as you want with a professional production studio at the helm. Or you can step behind your own digital camera, interview your CEO about the business, cut in stock footage from a site like Shutterstock and add in a voice over before calling it a day. 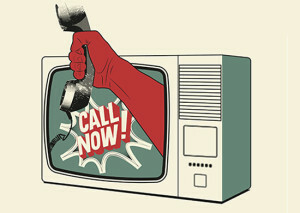 Another option is to ask a cable TV station to produce your commercial for you. Rates are usually low, or even free, in order to snag your business. This could free up money from your production budget to put towards your media buy to maximize your exposure. Not all air time is created equally. You may already have a cheaper ad slot for 2:30 a.m. in mind, but what are your customers watching when it actually runs? A hardware store shouldn’t run ads during a middle-of-the-night romantic sitcom re-run any more than a liquor store commercial should air during a religious sermon. Work with your cable station to determine the most targeted time slot for your needs while keeping the balance for your budget. Negotiating for a few perks or asking for a media mix can amplify your ad’s effectiveness. For example, getting an ad run on local websites can increase your brand awareness and get more views without much strain to your budget. You can also inquire about uploading your spot to YouTube for additional increased exposure. And while you’re at it, couple your ad time with a social media hashtag campaign. Use a hashtag like #TopChef when talking about your product while your commercial airs in the background. After your ad runs, request an Affidavit of Performance. This signed and notarized form is proof that the promised services were rendered. It should also enclose the cost, timing and content of the commercial as a thorough record of what you’re paying for.